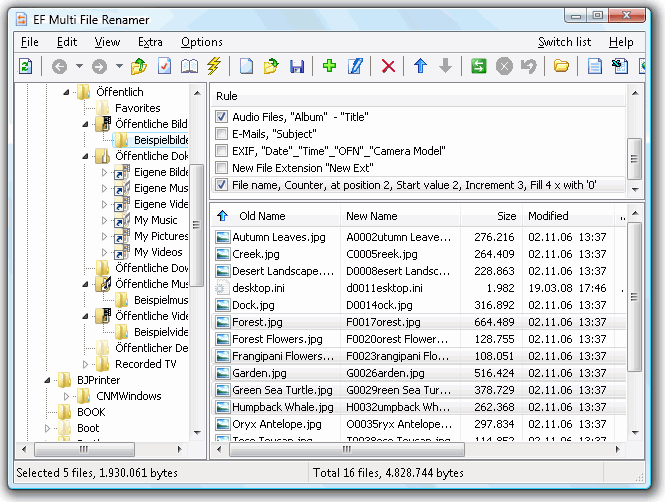 * The Windows Explorer-like interface offers an optimal overview of the entries. * Clear, easily understood definitions, from simple to complex renaming rules, with multiple options. Rule sets can be saved and used again later. * Full real-time preview of the new file names before they are actually renamed, including error recognition when name conflicts occur. * Undo the last renaming operation. * Recursive processing of subfolders and the files contained in them. * Filter function to restrict file renaming according to specific criteria. * Integration of external third-party description plugins in WDX format. * Export of file lists in different formats. This page was last modified on 10 April 2019, at 08:52.